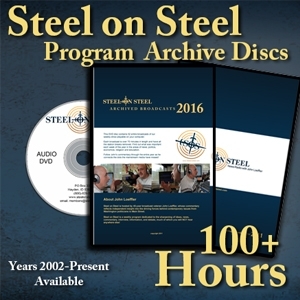 These DVD-ROM discs each contain an entire year of Steel on Steel Archives in MP3 format. You get 52 entire broadcasts of our weekly show, including the weekly Section 6 intelligence brief, playable on your computer or transfer the MP3s to your portable player. Archived broadcasts since 2014 have the Section 6 Intelligence Brief added and usually run an additional hour. That's over 100 hours of programs per year! Each broadcast is between 70 to 135 minutes in length with no interruption. Find out what was important each week of the year in the areas of news, politics, economics, religion and education. Follow John's commentary through the entire year as he connects the dots the mainstream media have missed! Years 2002 to present.